I don’t care much about phones. I don’t give a toss about eye-candy fancy stuff. It’s a tool and only phone related features matters to me. Also, I tend to break things: obviously because I’m careless (yes, I don’t care much about phones, as already stated). So when picking a phone, I go for the easiest to carry: lightweight and small. If it’s robust, it’s a plus. But so-called smartphones seem to get bigger and bigger over years. So when my last phone died, I bought the cheapeast and smallest smartphone that was available to me through my phone provider. It’s a Samsung wave 723. Not bad hardware-wise. Sure, there is better hardware around, but every piece of hardware is or will be bested soon in one way or another: as long as it’s good enough, then it’s good. No, the obvious drawback is the OS it came with. The OS is called Bada OS and seems to be one more Linux based OS, developed in-house by Samsung. It depends on Libre Software but it’s not obvious that it is composed of such software. 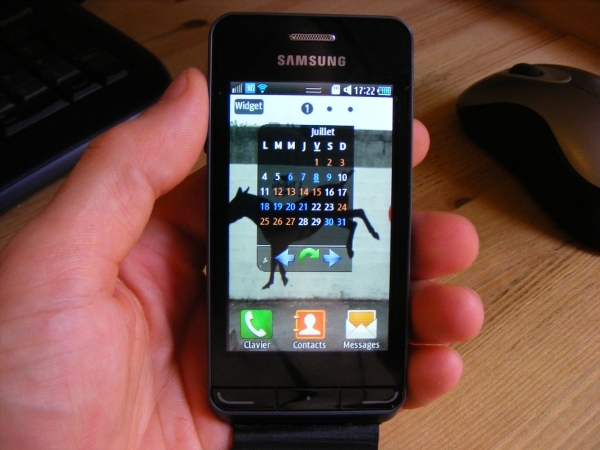 Well, two weeks after getting this phone, Samsung announced they will no longer provide OS software upgrade for the Samsung wave 723 and several others of the serie. Brand new and already obsolete, the wave 723 is stuck with Bada OS 1.1 while Bada OS 1.2 provides T9 trace, which is not exactly what I consider frivolous. Clearly, I’ll take into account this policy from outer space next time I’ll buy a phone. So, next time, I’ll definitely think twice before wasting time with a Bada OS-based phone.